Sold at $419.99 on store.insta360.com, Insta360 EVO brings a revolutionary way to capture life’s best moments. A compact, quick-folding body allows EVO to transform between two shooting modes, one for shooting lifelike 180-degree 3D content and another for immersive 360 that captures every angle at once. Relive what you love – We remember experiences in three dimensions, and to fully capture a moment, a camera needs to do the same. EVO makes it easy to immortalize the moments that matter. Unfold its dual lenses, tap the shutter button and EVO captures reality just as we see it. 5.7K 180 3D video and 18 MP 180 3D photos mean that both details and depth stand up to reality. Life all in – Some experiences are so rich and unpredictable — or they demand so much of our attention — that it’s impossible to choose just one direction to point a camera. Two new ways to play – Content captured on the EVO can be played back on any VR headset, allowing for 3D immersion. 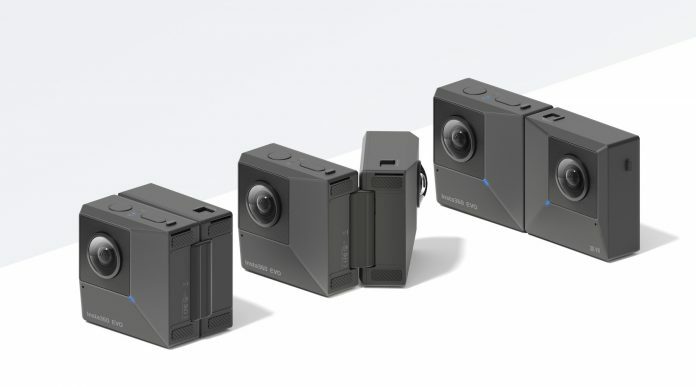 Using the new Insta360 VR app, users can also wirelessly connect EVO to an Oculus Go, HTC VIVE Focus (support coming later this month) or Samsung Gear VR for instant 5.7K playback straight off the camera. The app also offers streamlined file transfer and real-time VR monitoring while shooting with the EVO. There are times, though, when a headset isn’t handy or when it’s easier to share a moment with friends and family by simply opening it up on a phone like we usually do. That’s the idea behind the innovative Insta360 HoloFrame, allowing naked-eye playback of 3D content straight from a smartphone — no glasses needed. Insta360 co-engineered HoloFrame with Mopic, a South Korea-based company focused on innovative approaches to 3D playback. HoloFrame pops straight over a smartphone display (think a reverse phone case). Then, users open their favorite 3D photo or video in the EVO app. During playback, the app uses eye-tracking to align with a viewer’s gaze and display an image that takes on a lifelike three dimensions in their line of sight. It’s a groundbreaking way to experience 3D content that has to be seen to be believed. Sold separately, HoloFrame is priced at $29.99 USD and available today for iPhone models X, XS, XS Max and XR, with additional versions for Samsung Galaxy S8, S8+, S9, S9+ and Note 8 models coming soon. 180 3D to go – Good stabilization is essential for both 360 and 180 3D content, especially when it’s viewed in a headset. That’s why EVO uses FlowState Stabilization, the industry-leading tech that captures footage so stable it looks gimbal-mounted. Filming 180 3D used to mean you were stuck in place, with footage that became unwatchable as soon as you moved. Now, creators can move freely to get the shot, while ensuring footage stays smooth, steady and headset-ready. Control time and perspective – Insta360’s signature TimeShift mode puts a 360 twist on time-lapse and hyper-lapse photography, allowing EVO users to control both the flow of time and the perspective of the camera at any given moment. TimeShift is a killer feature for travel experiences, family events and more. HDR video and photos – When you shoot an ultra-wide 180 or 360 field of view, accurately capturing the full range of lighting information in a scene is especially important. EVO uses best-in-class HDR video capture technology for both 180 and 360 shooting modes. Scenes look natural and vibrant in every direction, with no post processing necessary. HDR photos are also supported for both 180 and 360 shooting modes. Shoot and edit in a snap – The EVO’s companion app makes capturing and editing great moments easy. WiFi connectivity lets users see what they’re capturing on EVO in real time, and then quickly transfer footage to their phone. Next, they can review, trim and tweak 180 and 360 content with a few taps, or reframe 360 footage to create a perfect edit. The app also lets users easily publish 360 and 180 3D content to supporting platforms, such as YouTube and Facebook. Available now – EVO is priced at $419.99 USD and available to order now via Insta360.com!